When Nintendo launched the Game Boy Color, many mistakenly thought it was the original now with color. Who can blame them though, with a name like Game Boy Color, it just makes sense to jump to that conclusion. However, the GBC was so much more. Capcom had their hands full with their port of Dragon’s Lair to the GBC. 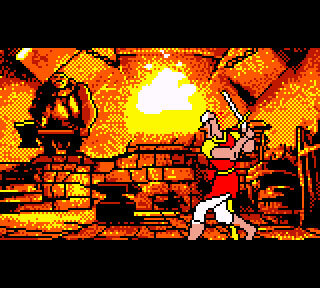 Since there was already a Dragon’s Lair game for the original Game Boy, which was a 2D action game on the NES, the GBC version had to be unique. How unique was Capcom willing to make it? They included nearly the whole arcade game, yeah, the LASERDISC game, as a Game Boy Color game. This is a feat that certainly opened the eyes of many naysayers of the GBC. Much like the Laserdisc arcade original, the GBC version of Dragon’s Lair is all about reacting to the onscreen prompts and action. Since the Game Boy Color cannot really do a ton of full motion video, Capcom got around it by recreating the scenes with sprites and clever animation. Fans of the arcade original will recognize all of the scenes that are included. Those same fans will also recognize the simple fact that death is right around every corner- even when your timing is impeccable. The colors of the Game Boy Color are put to good use in this port. Corridors are typical dingy, grime filled affairs while Dirk is clearly visible in each scene. The fun of Dragon’s Lair is figuring out the method to get past all of the challenges that are presented in each screen. Capcom outdid themselves with their port of Dragon’s Lair to the Game Boy Color. It is rather mind boggling that a port was not done for the much more powerful Game Boy Advance by someone. Obviously this game has not received any digital distribution re-releases so if you want to play it, you will have to secure a physical copy. Check out the video below for game play. Have you played Dragon's Lair for GBC? Let us know in the comments! Carl Williams is a gaming journalism veteran reaching nearly 10 years of covering obscure and interesting games. Primarily writing for Retro Gaming Magazine, Carl does enjoy stepping out and writing about technology and movies for his other site, Gravis Ludus.